Rooftop Balcony with view of Dublin City and Mountains. Close to Sandyford Business Park. Henry Wiltshire are delighted to offer this spacious, light-filled penthouse apartment in the very popular Belarmine village. Within walking distance of this beautiful apartment, is the well laid out shopping precinct which includes a Fresh convenience store, a dry cleaners/ launderette, a pharmacy, medical centre and fitness centre as well as a creche/Montessori. Located within close proximity of the M50 motorway, this 2-bedroomed apartment has glorious views over Dublin city. On entry to the apartment, the Hallway leads to a well laid out, airy, bright and spacious Living/Dining Room which has floor to ceiling windows and affords spectacular views over the city. The Living/Dining room leads into a well-equipped kitchen. A door from the Living Room leads onto a balcony of very generous proportions. 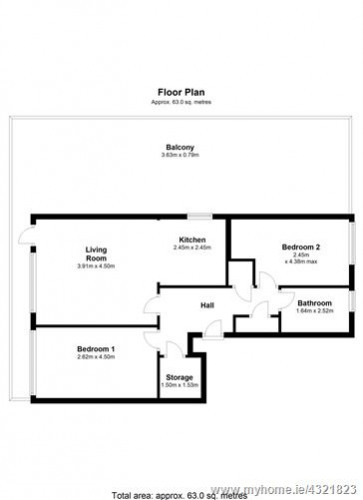 There are 2 spacious double bedrooms and both are fitted with wardrobes. A generous sized family bathroom with bath, wc and vanity unit whb.